This post will discuss events of Rogue One; beware spoilers. Lyra Erso, the wife of scientist Galen and mother to daughter Jyn in Rogue One, appears on screen for only a few minutes. Very little is known about her beyond roughly sketched out roles: mother, wife, geologist and cartographer (known only through ancillary media), rebel-sympathiser, believer. Jyn’s journey is driven by her relationship with her father – then later the adoptive father substitute of Saw Gerrera – with little acknowledgement of her mother despite Lyra’s desperate self-sacrifice in a vain attempt to protect her family. As a result, Lyra’s most lasting impression is of her faith and trust in the Force. This aspect of her character, and its influence, is expressed primarily through (surprise!) costume. L: Lyra Erso from Rogue One: The Ultimate Visual Guide, this unseen costume is slightly different from the costume seen on Lah’mu. 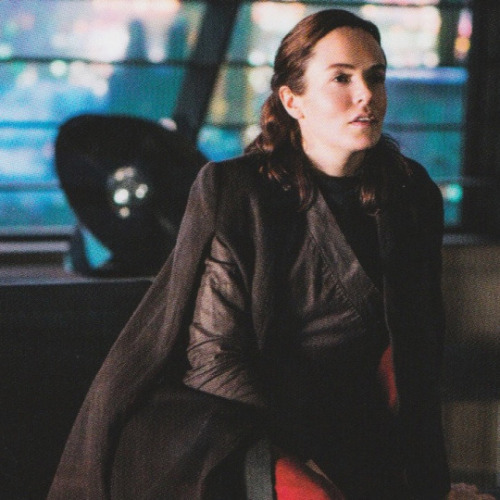 Her more severe hair paired with the coat of her overrobe and overskirt both suggest that this was a scene set earlier – possibly shortly after the Ersos fled the Empire – that was cut. C: Lyra Erso on Lah’mu as seen in Rogue One. (Unfortunately I have not been able to find a clear full-length shot.) R: Erso Family version 2a detail, Glyn Dillon. Here Lyra is shown with a red headscarf to match her sash and overskirt. Lyra’s colours are soft and earthy, not unlike those favoured by the Rebel Alliance, blending with the dark landscape. Except for the bright slash of red in her overskirt. The Ultimate Visual Guide describes this as a ‘red sash of enlightenment’. Worn over a heavy padded underskirt and trousers, this overskirt and sash are a statement rather than practical, and given that at one point it was layered under a darker overskirt it is a loud and emphatic statement. Given Lyra’s actions when Krennic comes to abduct her family, she is a woman tired of hiding. This over skirt is similar to the hakama worn by Japanese Shinto miko or shrine maidens: a pleated skirt overlapped and tied at the waist. Today miko perform typical temple duties, but at one point they performed shamanistic roles not unlike the Ancient Greek Sybils: entering trances to communicate with spirits of the dead, elements or land in order to learn, purify and share divine revelation. In a less literal sense, this could translate to Lyra as a geologist, a scientist that has learned to understand rocks and the land; to let the world speak to her, even if it is not directly through the Force. Faith and science combined to allow a greater understanding and an open mind. A similar garment is worn by Chirrut Imwe, a Guardian of the Whills, though his overall costume appears to be more inspired by a fusion Chinese hanfu and Buddhist robes. L: A modern miko or shrine maiden wearing the red hakama. C: Chirrut & Baze concept art, Glyn Dillon. ‘Baze is like a combination of all your favourite elements of star wars characters. the partial armour, the boiler suit, the cool gun, the backpack. Gareth really responded well to the red, so we put some red in Chirrut as well.’- Dave Crossman. As principal heroes, Baze and Chirrut’s looks will have been in development long before Lyra’s. The presence of this red and its importance is something that may have been seeded through the production’s costumes from this starting point. R: Chirrut Imwe in Rogue One. Note the layered skirts and sash akin to Lyra’s. Although it is not stated if Lyra is in anyway connected to the Whills, or if she follows some other related faith, the similarity in these garments implies that either she has had some association or it is a widely adopted colour. On Jedha we see a very great many pilgrims, priests and guardians wearing this same shade of red in a number of different garments. Red is a colour that typically holds Dark Side connotations in Star Wars, though has also appeared in association with ambiguous but self-serving Night Sisters. Here, however, it appears to be a positive expression of connection. In China and India red is a colour of good fortune. In Buddhism, a real world influence on the Jedi Order, red is considered to have been a colour that emanated from Buddha when he achieved enlightenment, and a colour of protection against evil, a belief shared by Shinto. Red being used by these faith-based Force religions shows a difference in approach – a multitude of approaches – to the Force, to understanding and engaging with the Force and the wider galaxy. 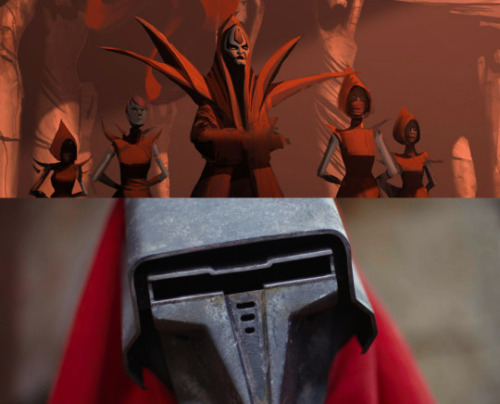 Top: Nightsister concept art from The Clone Wars Bottom: Silvannie Phest, ‘Part of a colony of Anomids that have recently converted to become disciples of the Whills,’ Star Wars Ultimate Visual Guide. One of many disciples and pilgrims of the Whills seen on Jedha. We see Lyra Erso once more in Rogue One – briefly, fleetingly in Jyn’s dreams, shrouded in shadow when she doesn’t have her back to the camera (and Jyn, as this sequence is shot from Jyn’s perspective.) A clearer image of this costume appears in the Ultimate Visual Guide (above.) This costume appears to be a fascinating intersection of Republic and fledgling Imperial fashions, a blending of styles and regimes. This short scene – a memory, really – took place roughly two years after the fall of the Republic. In that time Palpatine, a terrifyingly savvy and aware politician and Sith, would have implemented changes and redirection in fashion and textiles industries with effects rippling out from Coruscant and the core planets. Just like all other industries, fashion is a tool to be utilised and maximised to ultimate efficiency and reward, but in this case to control and manipulate the populace. Lyra Erso on Coruscant, approximately 2 years after the fall of the Republic. In an early concept painting of this sequence, Lyra was depicted wearing a sari. In 1930 Mussolini stated, “Any power… is destined to fall before fashion. If fashion says skirts are short, you will not succeed in lengthening them, even with the guillotine.“ In both fascist Italy and Nazi Germany, boards were formed to promote and enforce national fashions, to propagate conformity to their respective ideals: fashion was recognised as a key lynchpin for rapid social and cultural change. In Germany this led to a promotion of traditional and subdued wear, a push for modesty away from the extravagance and vanities of the French, idealising history. In Italy, however, it was the avant garde and modern that was hailed in fashionable circles, architecture and fashion shifting hand in hand. There was a search to control, measure and literally shape the body to achieve the Italian ideal future by fusing science and fashion. Imports and influences from other countries were banned in order to elevate purely Italian lifestyles. As we saw in Revenge of the Sith there was certain turn towards the militarisation of Coruscant fashion, as is somewhat inevitable in a time of war. The little we have seen – Lyra, the various senators in Rogue One (though it is unclear whether they have absolutely defected ala Mon Mothma – a woman who found a look and stuck to it her entire life – or if they are playing the game like Bail Organa) – suggests that Imperial built on this foundation and took it to its extreme. Simplicity, clean lines and strong shoulders and sharp angles. Muted colours and a certain uniformity even in their differences. Senator Jebel – Jebel speaks most loudly against open fighting against the Empire; Jyn Erso, Senator Vaspar – Vaspar’s cloak is red-lined, ‘denoting the Battle of Balamak’; Senator Pamlo. Lyra’s Coruscant costume, however, does not quite carry this absolute uniformity, even as her husband is in an actual uniform. The split-sleeve wool coat has a militaristic flair in the blocky severity of the shoulders. This also appears to be the same coat worn in the unseen Lah’mu costume from the Visual Guide above, there worn and shabby, the shoulders sloping and broken. Lyra’s pragmatism in reappropriating clothing from her former also shows her disdain for the emerging Empire and its stylings. The Jedi influence remains in the crossover of her tunic or dress, now transposed into textured, coated blacks (I believe that this may be a coated linen or similar.) As on Lah’mu she appears to have also layered this over a softer high-necked undershirt. The cut of this costume, beneath the coat, appears to be essentially the same as her later costume, just more angular, more hard in stiffer fabrics. Shades and layers of black, but the textures and combination of matte and sheen creates and impression that is not absolutely black. And then there is the red, subsumed deep in shadow and layers. Red lining of the coat, and a red underskirt. Undoubtedly the same, or another, sash of enlightenment which stands out against the greys and the shadows of the setting. Red in western Europe often has connotations that suggest danger, passion. This red is a burst of light in a grey setting, on a grey and dark world where red is a colour owned by their newly instated Emperor (Palpatine’s offices, his robes all in shades of reds, burgundy, wine; the Red Guard. Red of a Sith’s ‘saber.) In the French Revolution, red was adopted by radical parties as part of the tricolore to symbolise liberty, personal freedom. This was particularly applied to the bonnet-rouge or red Phrygian caps that were inspired by those worn by freed slaves in ancient Rome. Lyra’s red here is her own secret rebellion, her expression as a free individual of her continued faith in the Force in an increasingly controlled and restrictive world. Perhaps her quiet support of the now-eradicated Jedi. She conforms even as she defies. L: Storming of the Bastille, Tancredi Scarpelli, 1789. The ‘Republic’ was often expressed through a brunette young woman wearing the bonnet-rouge. Note the red sash. C: Propaganda photos of Occupied Paris, Andre Zucca 1941. French photographer Zucca was hired to show occupied Paris as a bright, bustling metropolis at odds with the realities of starvation and desperation. Parisian fashion was allowed to operate as usual, in direct contrast with the seemingly carefully controlled, subdued fashions of Berlin which promoted elegance, traditional femininity and national rural dress. Some 60 Parisian fashion houses collaborated directly with and for the Nazi’s – most famously Hugo Boss and Chanel – though attempts to relocate the heart of the fashion world to Berlin were furiously resisted. [x] Allegedly Hitler himself loathed make-up, citing reasons of animal cruelty. R: Imperial dress in satin and silk with a knot of savoy coat-of-arms and Renaissance cape, Fernanda Lamma, Il Commune di Bologna. Roman symbolism was adopted, incorporated into textiles to affirm and support the regime. Futurism, modernism and historical influences were combined to create a strong ‘new imperial style’. Beyond dreaming about her mother in shadows, Jyn barely makes any direct reference to Lyra after her death. But Lyra is a muted, unacknowledged presence in her daughter’s life. Over the course of Rogue One we see Jyn at three ages, every iteration wearing some element of this red – this red of enlightenment, of rebellion. 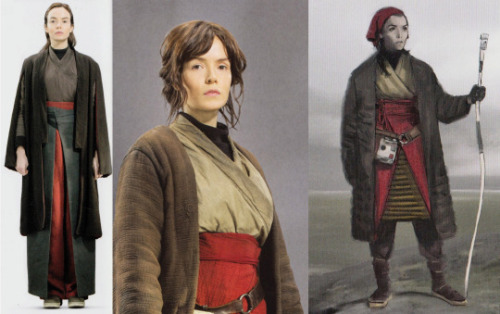 When she is four in a dream, Jyn wears a red sleep tunic in the same style as her mother. On Lah’mu, Jyn’s tunic is barely-seen red-lined, perhaps Lyra’s attempt to keep this faith – or the Force – present in and with Jyn whilst keeping her protected and hidden. Then grown Jyn, bitter and disillusioned and abandoned, still carries this red with her, this faith and memory of her mother. It is, like her potential and her willingness to fight, close and buried and mostly ignored. Jyn is shown pulling out Lyra’s kyber crystal – the last thing her mother gave her – at a number of points in the Rogue One, before pulling it out one last time and holding it close. Not praying perhaps, but something like. Jyn may not have same the faith of the Force, though she remembers both her father’s teachings (and implicitly her mother’s), and has found a cause and purpose. 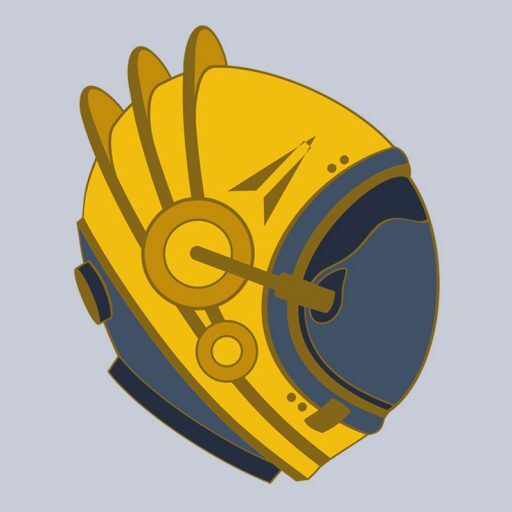 A team to believe in, and hope. She learns to look up, which is a form of enlightenment in itself.